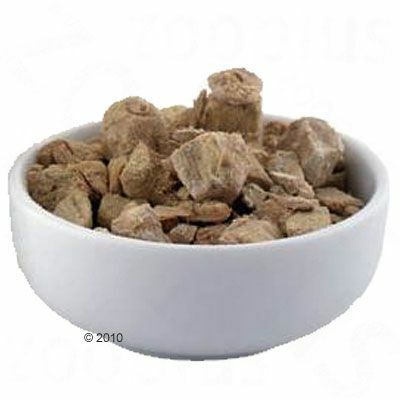 Thrive Cat Treats: Free P&P on orders £29+ at zooplus! 100% natural and additive-free cat snacks made only from 100% fresh meat or fish. Freeze-dried to lock in the taste and goodness and in a practical and handy resealable tube. Absolutely crazy for them :"Cats like treats in general, my cat is no different. But these ones make him go craaaazy. He loves them that much, buying the saver pack now"
Tasty thrive Cat Treats from Petproject are a premium cat snack, made using only fresh fish or meat which is freeze-dried to lock in the taste and goodness. 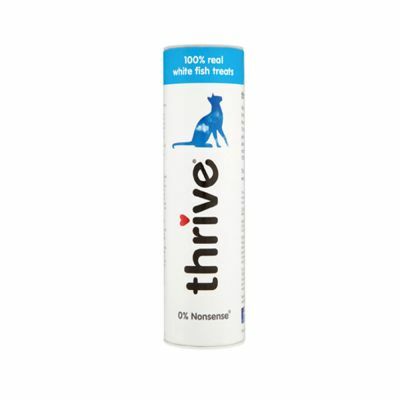 thrive Cat Treats come in a unique re-sealable tube and are a 100% natural, delicious snack for between meals. These snacks are well accepted and your cat will adore them. thrive Cat Treats are made from 100% wholesome fish or meat and contain no additives, preservatives or colours. Your cat will not be able to get enough of them. The complex freeze drying process preserves the delicious treats and ensures that all important nutrients are retained and that the great taste is not affected. Freeze drying is an exceptionally gentle production method and frequently used by the pharmaceutical industry. British vets frequently favour thrive Cat Treats because they are very palatable and well accepted by cats of all breeds. 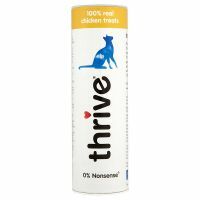 Supplement meals with up to four thrive Cat Treats, twice daily. Fresh drinking water should always be freely available for your cat. 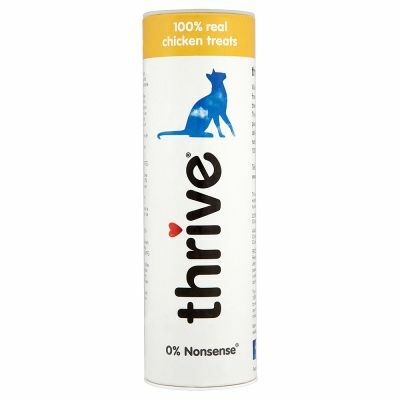 Tuna variety Thrive treats (closely followed by the chicken) are my cat’s absolute favourite - she turns her nose up at most other similar products and gobbles these down as fast as she can. However, the most recent tuna tubes I’ve bought have not been as good quality & inedible - they’re hard, irregular shaped & not as recognisable as decent pieces of protein as they used to be. Excellent, my kittens learned very quickly to come indoors when I rattled the tube. Now they know when I pick it up! I feed my kitten these & also the Chicken Liver variety. The Chicken liver ones are a better size & she likes the taste better. These chicken flavour are great quality, but an inconsistent size. I break up some of the larger pieces for her. 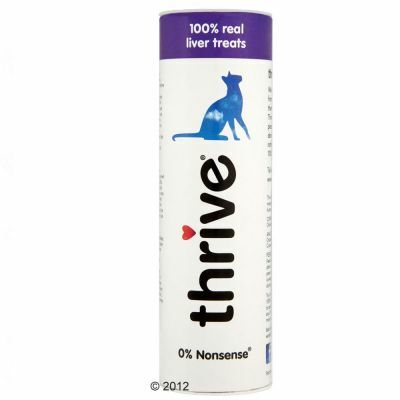 I have been buying Thrive for many years and my Siamese cats love them. I buy many of them. all flavors. Over the last two years I have noticed they had become hard and would get stuck in the teeth of my cat and a few times he chocked on them. This has happened regularly now to the point that I complained and contacted Paul Singer the CEO of Thrive as I ended up throwing most of the product out. I decided to start keeping the defective ones and sent back 6 tubes! Very disappointed!!!! Got the chicken flavour as a gift with loyalty points and both cats went mad for them, even the fussy one who usually takes her time with new things couldn't eat them fast enough! All cats are different, they won't 100% eat everything. My cat for one absolutely adores these, any flavour. In fact he likes all thrive products (except the samon dry food lol) He drools and gobbles these up, again, all cats are different. We’ve tried all flavours and our cats love them so much they come running as soon as they hear the sound of the lid popping open! The white fish and the chicken do seem special favourites but all are very good. Our cat will do almost anything for a thrive and loves them more than Dreamies! My cat adores these. She knows the 'shake hands for a treat' trick and the moment these comes out, she's reaching for my hand to shake because she knows treats come after that. Chicken liver is her very favourite. I appreciate the fact that they're very wholesome and healthy - which is good, because a couple of times she's run off with the tube to open it behind the sofa and scoff the lot. Excellent treats, all 3 Somalis go crazy for these! These are the best treats on the market, being healthy and nutritious too - 100% pure chicken. 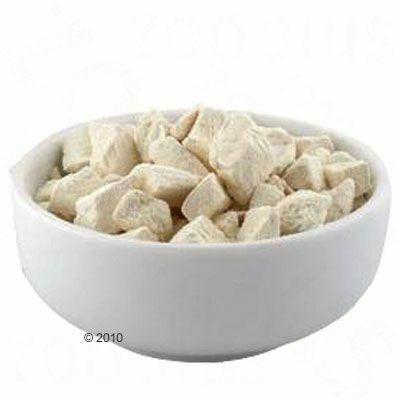 They are formed lumps of freeze dried chicken breast - which can also be crumbled between your fingers to use a topping for cat food. Also very good for retrieving your cat if he /she won't come home - simply shake the tube - and they will come running excitedly at the sound! Only problem is that they are a bit expensive, but if you buy the 5 pack, it saves on the costs. My 2 year old cat absolutely loves these treats, but twice now I have had the horror of watching him choke on these. I think they are too dry and stick in his throat, so just a word of warning to others. Trying to help a choking cat is not easy! Looking at the other reviews, these treats seem to be like marmite, cats either love or hate them. Mine loves them since I first tried them. I give my ragdoll the chicken and fish flavours (and he follows me around the house if he sees me holding the packet!) but will be trying the others too. The pack seems small but the pieces are actually quite big, so I tend to break them up when I give them to him. Cats go crazy for them! Our vet gave our kittens these when they went for their first jabs and they liked them so we bought a few tubes. Now they LOVE them and go absolutely nuts just when we shake the tube! My cats won't touch them. I bought all four flavours and they won't look at them. I'll stick to dreamies. My cat won't go near them! I bought these with great hopes reading the review and the ingredients. Unfortunately my cat wouldn't even sniff them. I think it's because of the taste, maybe chicken would work better but I bought tuna - I never thought I'd find a cat who doesn't like tuna! maybe I will try a different one. one of the highest quality treats on the market, my cats go crazy when I shake the tube before going out. 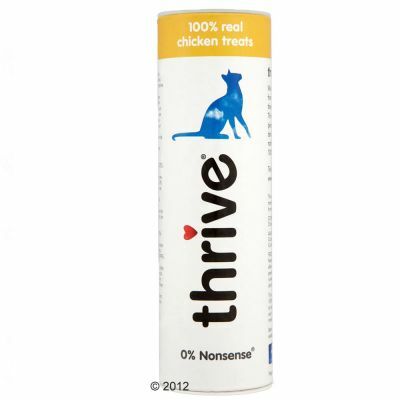 I give thrive treats 4 stars instead of 5 as they are dusty sometimes as well as chicken bits fall apart sometimes in my hands. forgot to mention that I came across realy bad quality fish treats once, they were not as dry as usual, quite moist and brownish, maybe there was an issue with the packaging. My cat loved these and more so than Dreamies and he loves those too! Liver was the flavour we tried for him. He even tried raiding the tube in the middle of the night. Ordering more. Going to try different flavours. My kitten is not even slightly interested. I called him to come and he was running as I trained him. But when he found out its this I'm holding he just sniffed and walked away. I tried a few times and its the same result. I'm very disappointed.